The BMW S14 is a DOHC four-cylinder petrol engine which was used in the E30 M3. It is based on the BMW M10 block and cylinder head from the six-cylinder BMW M88 with two cylinders removed. There is no direct successor to the S14, since the following generation of M3 is powered by the BMW S50 six-cylinder engine. Two separate throttle bodies are used, each incorporating two throttle butterfly plates. This version was only sold in Portugal and Italy. It has a displacement reduced to 1,990 cc (121.4 cu in) by shortening the stroke to 72.6 mm (2.9 in). The E30 M3 was initially released with the 147 kW (197 bhp) S14B23 engine. Versions equipped with a catalytic converter produced 143 kW (192 bhp) and 230 Nm. This update of the S14B23 produced 162 kW (217 bhp), or 158 kW (212 bhp) if equipped with a catalytic converter. In 1989, the displacement was enlarged to 2,467 cc (2.5 L) and this engine produced 175 kW (235 hp). ^ a b "BMW World - BMW S14 Engine". Usautoparts.net. Archived from the original on 2012-03-29. Retrieved 2012-06-03. ^ a b "FAQ E30 320is (S14)". BMW M Registry. Retrieved 2012-06-03. ^ "Euro E30 320iS – Italian M3 | BMWE21.net – Jeroen's BMW E21 Network". Bmwe21.net. Retrieved 2012-06-03. ^ a b c d "BMW Heaven Specification Database | Engine specifications for Motorsport engines". Bmwheaven.com. Retrieved 2012-06-03. 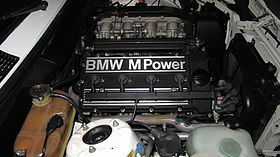 Wikimedia Commons has media related to BMW S14 engine.